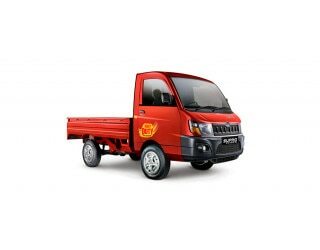 Dec 11, 2018: The Mahindra Supro Minitruck is a great light duty truck and falls below the Maxitruck sibling. It comes with a payload capacity of 850 kilograms, which is good enough for transporting the goods within the city. The cabin is good enough for just the driver and co-driver and does not have air-conditioning too. Tiltable power steering and adjustable driver seat are the notable interior features. The braking system is handled by the hydraulic brakes. The truck is equipped with a 909cc, two-cylinder BS-IV-compliant engine which pumps out a maximum power of 256 bhp at 2,600 rpm and a peak torque of 55 Nm between 1,800 and 2,200 rpm. It comes mated to a 4-speed manual transmission. The engine returns a mileage of 23.17 kmpl.